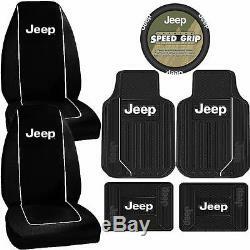 Jeep Elite Mopar Classic Seat Covers Rubber Floor Mats Steering Wheel Universal. Highback Seat Covers: 2 Front cover , will NOT fit seats with build-in seat belts, Sport bucket seat or seat belts attach to seat. New Jeep Elie : Front Floor Mats approximated dimensions 17.38" x 26.50" and Rear Floor Mats approximated dimensions 14" x 17". New : 1 Steering wheel cover fits MOST 14.5" - 15.5" wheels. Floor mats are made of high quality Heavy duty Rubber material. Can be trimmed for a better fit. This listing includes 2 front rubber mats, 2 rear rubber mats, 2 seat covers, and a steering wheel cover. The floor mats will provide all weather protection to your vehicles interior from (dirt, mud, snow, or any other debris). If your seat has a headrest, you will install the seat cover over the headrest after adjusting it to your desired position. These are universal fit seat covers that are designed to fit MOST high or low back bucket seats that are equipped with a detachable or built-in headrest. The covers will not fit a seat that has a built-in armrest, built-in seatbelts, and/or air bags built into the seat itself. The steering wheel fits most wheels between 14.5"-15.5". Please be advised that the color of the actual product may vary slightly from what you see in the pictures above due to the differences in screen resolutions. Please also be advised that most of our automotive accessories are universal-fit products, unless they specifically mention that they are custom-fit for one specific vehicle; any compatibility chart in the listing does NOT guarantee a perfect fit. Thank you for shopping with us. We are not open to the public. We will post tracking numbers directly on the Order Detail Page. International Customers: we will declare the full value of the item. We will not declare items as a gift. Unique Automotive Accessories does not take responsibility for charges caused by importing product into the customer's country. Can't find the answer you're looking for? Mailing Address: Lyfe Essentialz 4939 Cecelia St. Store Designed & Developed By. Powered by Solid Commerce The All-in-One Listing, Inventory & Order Management Solution. The item "Jeep Elite Classic Seat Covers Rubber Floor Mats Steering Wheel Universal" is in sale since Thursday, July 26, 2012. This item is in the category "eBay Motors\Parts & Accessories\Car & Truck Parts\Interior\Floor Mats & Carpets". The seller is "lyfe_essentialz" and is located in Bell, California. This item can be shipped worldwide.